US experts could accurately identify Alzheimer's disease and another type of dementia from structural brain patterns on medical scans, Neurology reports. Currently doctors can struggle to diagnose dementia, meaning the most appropriate treatment may be delayed. More invasive tests can help, but are unpleasant for the patient. Despite being two distinct diseases, Alzheimer's and frontotemporal dementia, share similar clinical features and symptoms and can be hard to tell apart without medical tests. Both cause the person to be confused and forgetful and can affect their personality, emotions and behaviour. Alzheimer's tends to attack the cerebral cortex - the layer of grey matter covering the brain - where as frontotemporal dementia, as the name suggests, tends to affect the temporal and frontal lobes of the brain, which can show up on brain scans, but these are not always diagnostic. A lumbar puncture - a needle in the spine - may also be used to check protein levels in the brain, which tend to be higher in Alzheimer's than with frontotemporal dementia. A team at the University of Pennsylvania set out to see if they could ultimately dispense of the lumbar puncture test altogether and instead predict brain protein levels using MRI brain scans alone. They recruited 185 patients who had already been diagnosed with either Alzheimer's disease or frontotemporal dementia and had undergone a lumbar puncture test and MRI scanning. The researchers scrutinised the brain scans to see if they could find any patterns that tallied with the protein level results from the lumbar puncture tests. 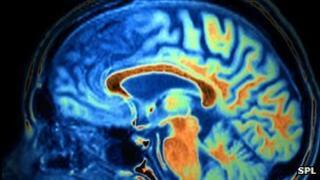 They found the density of gray matter on the MRI scans correlated with the protein results. The MRI prediction method was 75% accurate at identifying the correct diagnosis. Although this figure is some way off an ideal 100%, it could still be a useful screening tool, say the researchers. Lead researcher Dr Corey McMillan said: "This could be used as a screening method and any borderline cases could follow up with the lumbar puncture or PET scan." Dr Simon Ridley, Head of Research at Alzheimer's Research UK, said: "This small study suggests a potential new method for researchers to distinguish between two different types of dementia, and a next step will be to investigate its accuracy in much larger studies involving people without dementia. "While this method is not currently intended for use in the doctor's surgery, it may prove to be a useful tool for scientists developing new treatments. The ability to accurately detect a disease is vital for recruiting the right people to clinical trials and for measuring how well a drug may be working. "Ultimately, different causes of dementia will need different treatment approaches, so the ability to accurately distinguish these diseases from one another will be crucial." The only drug currently licensed in England and Wales for treating frontotemporal dementia is rivastigmine. There are four licensed treatments for Alzheimer's - donepezil, galantamine, rivastigmine and memantine.